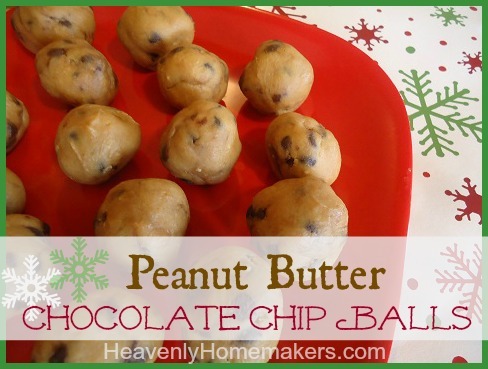 I love treats like these Peanut Butter Chocolate Chip Balls that are on the healthy side, plus they are very easy to put together! With four simple ingredients that many of us have on hand – I’ll bet some of you will hop right off your chair and get them started right away. I highly recommend that you do. But beware – these are little balls of peanut butter, chocolatey, coconutty addictiveness. You’ve been warned. Melt coconut oil and honey together in a saucepan. Remove from heat and stir in peanut butter until mixture is smooth. I use Homemade Almond Butter in most of these recipes. Once you learn to make nut butters, you’ll never go back to store-bought! Keep these recipes on hand – especially in the summer time when you don’t want to turn on the oven but you want to make a treat. I love that all of these No-Bake Balls are filling and offer nourishment too. 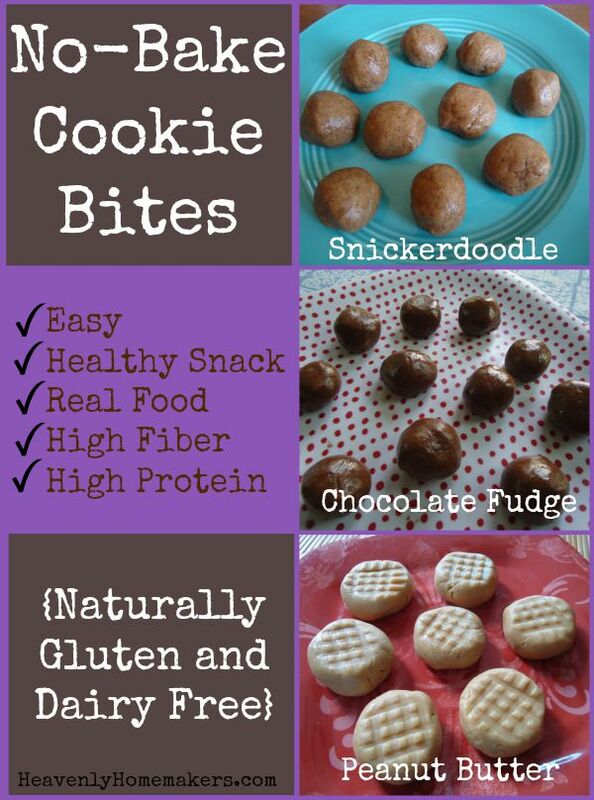 Protein, fiber, lightly sweetened…they are the perfect dessert of snack! These also work great in a lunch box. To top it all off, these freeze well so you can make several ahead of time and store them in the freezer until you need them! I love chocolate and pb together. If it wasn’t so late, I’d probably be making some… and probably eating it before spreading it in the pan! I WILL be making these!!! These look amazing & I love coconut too!! These look YUMMY! Love your blog!!! We have never made cookies that aren’t baked. Will have to give it a try. Thanks! Its a high five too! If I could only find a tasty nut free alternative I would try these. All I could think when I saw these was that to make them better, I would melt some chocolate chips and a little oil and dip them so that they were covered in a chocolate shell….not quite as healthy, but yum! I love these, Only I add oats to mine. They disappear at get-togethers. Simple and delicious…. Yep, sounds like a winner to me! These remind me of buckeye’s only healthier and easier! I make some peanut butter balls that look exactly like these. They are one of my family’s all-time favorites, but they have sweetened condensed milk and powdered sugar. I’m going to have to try this healthier version! These look delicious!! And couldn’t be easier. I will definitely be trying these!! Thank you! I’ve been collecting recipes to make this season with my kids to show them that there are alternatives! This is great! Making these today :) Can’t go wrong with pb & chocolate! I would just eat them all myself, and well then maybe make another batch for everyone else! Oh I must make these–afraid they will be hard to resist though! My little girl said she wants one cold haha! Hmmm, a different version of oreo balls, thanks! Yum! Anything with chocolate has got to be good! yum! Excited its something my kids can make by themselves too! Quick, easy and dessert!! The whole family can partake and it will turn out great- I love it! I’m going to have to try these! They look delicious! Can’t wait to add these to my “To Do” list! Yuummmmyyyy!!!!! I am all over these. Thanks for sharing. Can not wait to try this recipe! Oh boy do these sound yummy!! For an added bonus, dip these into some melted chocolate and place them in a mini muffin liner and cool in the fridge. Oh yum!!!! Yummy! These would be fun to make with the kids. These look good & only 4 ingredients, who can beat that! Yummy! And probably as addictive as the cookie dough ones I make…so dangerous! YUMMY!!!!!!! what a great recipe!!! thank you for sharing!!!!!!!! Yummy. I love pb balls. That could quench a lot of cravings. We always made peanut butter balls with honey and powdered sugar – never thought to add chocolate! Oooh, the only peanut butter balls I’ve had are the ones made with powdered milk (perfect for hiding crushed up medicine that your sister refuses to take…). I’ll have to try these! Honey’s great aunt , and I’m going to make these right now! Love your recipes, thank you so much! Chocolate and peanut butter is a favorite combo of mine. These look great! Tried them – these are delicious! Definately need to try these! These sound great! I can’t wait to try them. I think I will be trying these for sure. As I am allergic to coconut–any good alternative? I also will need to use almond butter in place of the peanut butter. These sound absolutely delicious in spite of my allergies. Maybe palm oil/shortening if that works for you. Using almond butter sounds great! I would love to try these. Thanks for the recipe! Those look delicious! Does it have to be coconut oil? Or will olive oil work just as well? I’m not a coconut fan. My chocolate melted (guess i was too quick in folding in the chocolate chips) and created a beautiful swirled look. So then I just cut it into squares and called it fudge – oh my- IT IS DELICIOUS! So melt in your mouth (literally!) and creamy! What a blessed Christmas treat for this dairy allergy girl and her not dairy allergy husband! I cannot wait until the dairy allergy kids can try it tomorrow!